There are hundreds of incredible dining options available at Walt Disney World. You’ll find international cuisine, dishes created by world famous chefs, and signature restaurants that don’t just offer meals – they offer experiences. Sometimes, though, you don’t want something fancy. Here are ten foods that you’ll find in most theme parks; and why Disney does them better. At Walt Disney World you won’t find the normal brands, it’s Mickey and his friends whose pictures are on your favorite sweet creations. You can find chocolate, lollipops, taffy, and hundreds of other delicious choices. If you want something a little more sophisticated there are different flavors of chocolate covered pretzels and crisp rice treats. 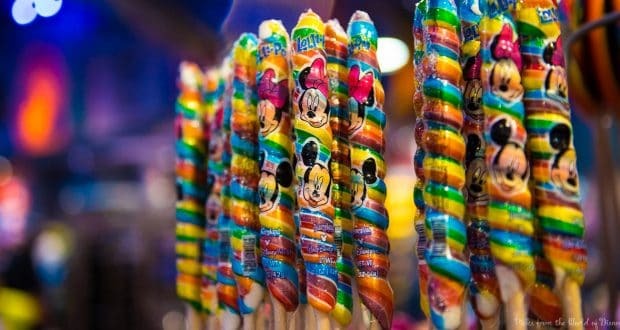 Many candies are sold under the brand Goofy’s Candy Company. To really get your candy fix, head to the Disney Springs store of the same name. It’s so popular that they host birthday parties there. The “healthier” cousin of candy is the candy apple. It’s fruit, so it has to be good for you, right? While other theme parks carry candy apples that are covered with caramel and maybe sprinkles, Disney’s candy apples are more creative than that. You can get your apple covered with caramel, chocolate, or dark chocolate, and it doesn’t stop there. Your apple can be shaped like Mike Wazowski, Olaf, Mickey’s famous red trousers, or something else equally as whimsical. If you really want an apple that you’ll never forget, head once again to Goofy’s Candy Company at Disney Springs. You can build your own apple by picking what it is dipped in, a topping, and a drizzle. It will be an apple that you’ll never forget. The turkey legs at Walt Disney World are so large that there is a rumor that they’re made out of emu meat. There is no truth to that rumor, they are indeed turkey. Each weighs approximately a pound and a half. Some people enjoy them as a snack, for others, they are a meal. You can find turkey legs in all four theme parks, in the water parks, and at Disney Springs as well. Popcorn is a great snack because it is delicious and simple. That is, at Walt Disney World it is simple unless you want something a little fancier. If that’s the case, a few of the flavors sold are cheddar cheese, caramel, cinnamon toast, chocolate caramel, and confetti. If you want plain popcorn your options aren’t over. You can buy it in a traditional popcorn box, or spend a little bit extra and get the souvenir container. Not all theme park hot dogs are the same. If you want something different, head to Casey’s Corner in the Magic Kingdom. You can try such creations as a Barbeque Slaw Dog or the Chili-Cheese Dog. Your dog will come with fries or apple slices. If you time it right, you can enjoy your meal while Jim entertains those around him. How many theme parks have a pianist at their hot dog stand? Check your Times Guide for more information. At some theme parks the funnel cakes are thrown together without a lot of thought about anything except for profit. At Walt Disney World, funnel cakes are a work of art. Available in several locations, you can enjoy one plain, or add a topping. Depending of where you buy your funnel cake it can be topped with powdered sugar, cinnamon and sugar, ice cream, chocolate syrup, apples, strawberries, whipped cream, or a combination. At Epcot you can even buy Pumpkin Spice Funnel Cake. It’s a delicious twist on a theme park classic. Cold, overcooked burgers on a stale roll with a side of soggy french fries are common at some theme parks. At Walt Disney World, a lot of thought has gone into the burgers and there are more options than you would ever think possible at a theme park! But we all know Disney is so much more than a theme park. You can create your own burger, or add to your burger from a topping bar. Vegetarians and those who don’t want red meat are also in luck, because it’s easy to find a delicious veggie burger. Fries that are cooked to perfection are often a side, but you’ll also find choices such as broccoli slaw, apple slices, or cucumber salad, depending on the location. Burgers aren’t boring at Walt Disney World. Not all pizza at Walt Disney World is special. At some Disney eateries it is rather bland. But there are other restaurants that make up for it. Disney does flatbread pizza right, so you might want to try a restaurant like Wolfgang Puck Grand Cafe or Mama Melrose’s Ristorante Italiano. For what might be the best pizza that you’ve ever enjoyed, make a reservation at Via Napoli Ristorante e Pizzeria at Epcot. Spring water that is similar to a spring in Italy is used, and the flour is imported from Southern Italy. How many other theme park pizzerias can make that claim? Warm, soft pretzels make a filling snack at any theme park. At Walt Disney World, you can get them in the shape of the world’s most famous mouse. Dips such as cheese are usually available as well. You can also buy filled pretzels, they come with sweet cream cheese or jalapeno and cheese on the inside. There are even more choices than that when it comes to pretzels. You can find flavored pretzels at both Epcot and Disney Springs. The choices make the pretzels at other theme parks seem a little bit plain. On a hot summer’s day ice cream will taste good at any theme park. What makes the ice cream different at Walt Disney World is the number of options. You can get hand scooped ice cream, soft serve ice cream, or Mickey shaped ice cream on a stick. If you still don’t see what you want, maybe a sundae will do the trick. Try the Sand Pail at one of the water parks, or head to the Ghirardelli Ice Cream & Chocolate Shop at Disney Springs. With choices like The Golden Gate Banana Split and The Strike It Rich Butterscotch Hot Fudge Sundae you might have a hard time deciding which one you want. For the ultimate ice cream treat, grab a few friends and head to Beaches & Cream Soda Shop at Disney’s Beach Club Resort. The Kitchen Sink is meant to be shared, you’ll be amazed by all the toppings. It contains several scoops of ice cream, cake, brownies, candy bars, chocolate and caramel toppings, and a whole lot more. You won’t find anything else close to the Kitchen Sink at another theme park anywhere.